To find a video highlight forÂ each player, please visit our department instagram or twitter accounts. FORT WAYNE, Ind. 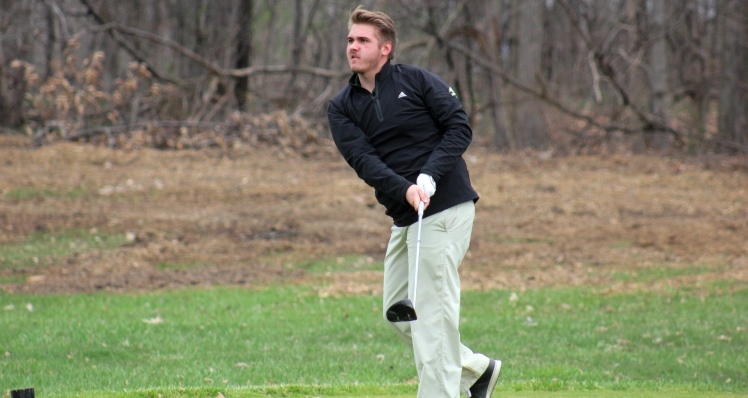 — Head coach Frank McAuliffe and the Marygrove men’s golf team made the trip to Fort Wayne, Ind. to play 36 holes at the 2015 Wolverine-Hoosier Athletic Conference (WHAC) Championships, hosted by the league’s fall champion, Indiana Tech. Thursday (April 16) marked the first of two days of golf at Fort Wayne’s Coyote Creek Golf Club as the young Mustangs looked to continue their improvement. Round one, the first 18 of the 54-hole conference championship, was the beginning of a successful day for the Mustangs. As a team, the Green and Gold posted a first-round team score of 340 â the second lowest team tally of the 2014-15 season. The Mustangs posted a 2014-15 best 338 in the fall when Michael Kanalas (Rives Junction, Mich./Jackson Northwest High School) shot a career-best round of 76 on Oct. 6 at the WHAC’s fourth jamboree. The 340 score lifted the Mustangs into a ninth place tie out of 11 teams after the first 18 holes at Coyote Creek Golf Club. Kanalas, a sophomore, finished tied for 31st after turning in a first-round scorecard of 81 after posting a 39 on the back nine and a 42 on the front. The 81 by the steady sophomore paced the Mustangs first-round effort, tying the Green and Gold with WHAC counterpart Aquinas College for ninth overall. Concordia-Ann Arbor checked in right behind Aquinas and the Mustangs, but finished round one looking up at the entire conference in 11th place. Fellow sophomores Tyler Newell and Jimmy Stewart chimed in right behind Kanalas with first-round 84’s (+12). The pair of 84 scores helped the Mustangs keep pace with the pack. Newcomer Austin Valentine (Westland, Mich./Concordia-Ann Arbor) tied his career best mark with an opening-round 91 to help the Mustangs check in with a 340 to start the day. For Kanalas, steady play was key as the sophomore recorded a par on 12 of the 18 holes to tally a team-leading 81 to open conference championship action. Stewart (Punta Gorda, Fla./Charlotte High School) checked in with an 84 thanks to six pars and a birdie on the par-five 15th while teammate [Tyler] Newell (Livonia, Mich./Dearborn Divine Child High School) got to 84 by working his way to an impressive seven pars through the first 18 holes. Valentine would tally three pars in round one and was responsible for the Mustangs first birdie at the championship event after he chipped in from 20 yards out on the par-four sixth hole. In the latter 18-hole round of day one, the Mustangs were once again led by the hot hand of Kanalas. The sophomore came up two strokes shy of his career-best effort after entering the clubhouse with a 78 (+6) in a round that featured three birdies and eight pars. Kanalas’ two-round total of 159 was easily the best 36-hole effort of the sophomore’s young career. Kanalas finished day one tied for sixth overall in total pars with 20. Newell followed closely with anÂ 81, one of his career-best round, to help the Mustangs finish the day eight strokes ahead of Concordia-Ann Arbor for 10th place overall. Newell’s solid second-round effort included seven pars and a birdie while Stewart aided the Mustangs’ solid day with an 84. Stewart’s 84 â his second 84 of the day â was made possible after the sophomore knocked in six pars, including a great save on the par-four 16th hole. Stewart also chimed in with one birdie, this time on the eighth hole to post a six-par, one-birdie round and mirror his opening-18 effort. Valentine, a recent addition to the Mustangs roster for the spring campaign, shot a 97 to finish the day with a pair of respectable scores. Despite adding six strokes to his first-round score, Valentine was able to tally three pars in the latter round to finish his first collegiate attempt at 36 holes. The Mustangs return to action tomorrow at Coyote Creek Golf Club for the final 18 holes of the WHAC Championships. A full recap will be posted on marygrovemustangs.com once official results are available.